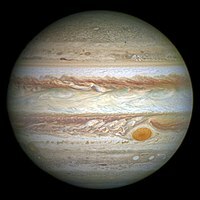 Jupiter is primarily componed o hydrogen wi a quarter o its mass bein helium, awtho helium anly comprises aboot a tent o the nummer o molecules. It mey an aa hae a rocky core o hivier elements, but lik the ither gas giants, Jupiter lacks a well-defined solit surface. Acause o its rapid rotation, the planet's shape is that o an oblate spheroid (it possesses a slicht but noticeable bulge aroond the equator). The ooter atmosphere is visibly segregatit intae several bands at different latitudes, resultin in turbulence an stairms alang thair interactin boundaries. A prominent result is the Great Reid Spot, a giant stairm that is kent tae hae existit syne at least the 17t century when it wis first seen bi telescope. Surroondin Jupiter is a faint planetar ring seestem an a pouerful magnetosphere. Thare are an aa at least 67 muins, includin the fower lairge muins cried the Galilean muins that wur first discovered bi Galileo Galilei in 1610. Ganymede, the lairgest o thir muins, haes a diameter greater than that o the planet Mercury. 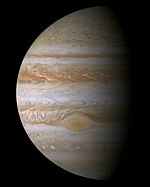 Jupiter haes been explored on several occasions bi robotic spacecraft, maist notably durin the early Pioneer an Voyager flyby missions an later bi the Galileo orbiter. The maist recent probe tae veesit Jupiter wis the Pluto-boond New Horizons spacecraft in late Februar 2007. The probe uised the gravity frae Jupiter tae increase its speed. Futur tairgets for exploration in the Jovian seestem include the possible ice-covered liquid ocean on the muin Europa. ↑ De Crespigny, Rafe. "Emperor Huan and Emperor Ling" (PDF). Asian studies, Online Publications. Retrieved 1 May 2012. Xu Huang apparently complained that the astronomy office had failed to give them proper emphasis to the eclipse and to other portents, including the movement of the planet Jupiter (taisui). At his instigation, Chen Shou/Yuan was summoned and questioned, and it was under this pressure that his advice implicated Liang Ji. ↑ Stuart Ross Taylor (2001). Solar system evolution: a new perspective : an inquiry into the chemical composition, origin, and evolution of the solar system (2nd, illus., revised ed.). Cambridge University Press. p. 208. ISBN 0-521-64130-6. ↑ "Young astronomer captures a shadow cast by Jupiter : Bad Astronomy". Blogs.discovermagazine.com. 2011-11-18. Retrieved 2013-05-27. Leetit in approximately increasin distance frae Jupiter. Temporary names in italics.